All Things Irish carries all the Irish and Celtic products you've come to expect, imported from Ireland and selected especially for their quality and appeal. Unique Irish Products You Didn't Expect! We also make regular buying trips to Ireland throughout the year, so that we can provide you with one-of-a-kind, limited availability items you won't find elsewhere! All Things Irish imports the finest products that Ireland has to offer to ensure you are buying the best gifts and products for you and your loved ones. We offer unique Irish gifts and Celtic treasures for every occasion. Whether it's a wedding, birthday, or you're just looking to add some Irish decorations your home - All-ThingsIrish.com has it all! Getting married? Honor your Irish heritage by including some of our popular Irish wedding items, including unique Irish engagement rings, Celtic wedding rings, toasting glasses, unity candles, and much more. Our online store is built on the latest technology to ensure you have an easy and secure shopping experience at AllThingsIrish.com. Please contact Customer Service or call toll-free at 866-777-7121 if you have any questions or can't find something you're looking for! We want to make sure you have the best Irish shopping experience. 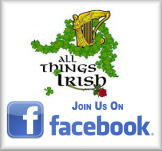 Whether you shop online or visit our store in beautiful downtown Coeur d’Alene, Idaho, All Things Irish is the place to shop for top of the line Irish gifts and merchandise.